In December 2017, a client pointed out to me that another local business’s blog content was displaying in Google News. I was perplexed at first, as indeed, an article from their blog was displaying in Google News. I checked the site out and it did not appear to be configured for Google News. To do this, I went to news.google.com and did a site search by typing in “site:domain-name.com” and received no results. I also looked at the blog’s content, and it was definitely not a blog which Google would accept in to Google News, and then I checked the site for a “news sitemap” (websites accepted in to Google News have a special news sitemap). Then I remembered an announcement Google made in September 2017 about “Community Updates”. If you have never heard of Google News, it is basically the site news.google.com. In many cities, especially suburbs like the one I live in, the big city news misses local news and events. They simply do not have the resources to cover all of the news. But, many local blogs do cover local happenings. On September 14, 2017, Google announced that they are now showing additional local publishing sources like high school newspapers and hyperlocal bloggers to help people find more information about their own communities. Does Google News still drive traffic? Believe it or not, Google News drives very little traffic. How do I know? I own a website which is approved into Google News and I consult with some other various publishers. Up until November 2016, being a Google News approved site was a big deal. Back then, Google had a section above organic search results called “In The News”. As more and more Fake News hit the web and Google was made to look bad around the 2016 Presidential Election, they scrapped “In The News” for “Top Stories”. Any google News approved site could simply publish an article and their content would be prominently displayed for 48hrs. On November 23, 2016, Google Replaced “In The News” with “Top Stories”. Believe it or not, this was first discovered and documented by myself here on Thanksgiving eve. Feel free to read about this here: Google “In The News” Replaced with “Top Stories”. I have also documented by findings the Top Stories algorithm as well. Since this change, most articles which make it to Google News drive drastically less traffic than they use to. I’ve personally met dozens of website owners who have shut their businesses down now due to the huge drop in traffic. If you’re actually the source breaking the news you will still get traffic. How do I get my content in to “Community Updates”? Are people actively searching for this content? If your article is about a 5K and people are actively searching for answers and your website is the only website with the information, it is likely to show up in Community Updates. Breaking News. If you’re the first to break the news, you will not only show up in Community Updates, you will also likely display in “Top Stories” as well. Recent content. In general, many articles which do make it to Google News / Community Updates have a very short shelf life. 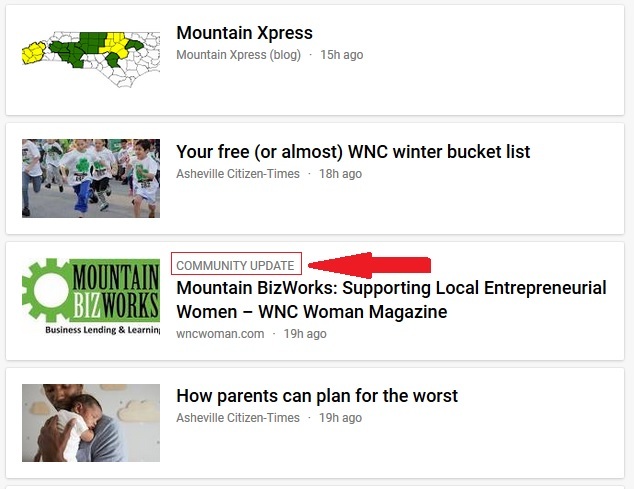 IF you’re blogging about Hyper-local news OR upcoming events AND you’re the only, or one of the few sources to cover it, THEN you may display in Community Updates. If you do this, you’ve likely already shown up in Community Updates and not even known about it. There is no special thing you have to do to show up in Community Updates other than putting out hyper-local content (that enough people are actively searching for). Also, do not expect to see any noticeable boost in traffic from this. Very few people know that Google News exists. My guess is that since Google just implemented this very recently, we’ll see a bit more of this in 2018. I do expect they may avoid content which is self promotional and remain focused on hyper local news and local events.